Doing something new with music is not an easy feat, the phrase “nothing’s ever new” isn’t around for no reason. However, after piling into the O2 ABC, I had no idea the kind of gig I would be in for. I have listened to Twenty One Pilot’s music for about 18 months now, and I was gutted that I wasn’t able to make their tour in May earlier this year. So I was determined, and lucky enough, to get tickets for their return to the UK. Before I talk about the main performance itself, I would like to mention their choice of support act, a loop-pedal artist named Jeremy Loops. Although their music may not be everyone’s cup of tea, anyone who starts their performance with loop-pedaled beatboxing harmonica music gets a thumbs up in my book. Jeremy Loops had a totally different sound from Twenty One Pilots but the unique quality of their music was the same. It was hard to label their music, and they got the venue pumped up and ready for the main act: what any good support act should do. It was a good choice by the co-ordinators and they were just a fun band to listen to. The main event itself was incredible. The energy of anticipation was already charging in the building, and when Twenty One Pilots came on stage the night only got better. The set began with ‘Heavy Dirty Soul’, a hit from their newly released album Blurryface; the high pace and fast lyrics only served to get the crowd even more ready for what was to come. The pacing of the set was well thought out with a good mixture of their high-paced songs and slow numbers, ensuring that there was never an overload of either. A pleasant surprise was the slow piano mashup they performed midway through the set, which not only contained some of their newer songs but also featured ‘The Pantaloon’ and ‘Addict with a Pen’ both from their older self-titled 2009 album. ‘Addict with a Pen’ was especially emotional, with almost everyone singing and nary a dry eye in sight. However it was not only their style that was evocative and experimental but the gig itself. The most radical part of the evening was when the stage crew brought out a wooden panel for the audience to hold as singer Tyler Joseph stood on it and sung. That in itself pretty different from your usual gig, but then they brought a similar wooden panel with a full drum kit on it and it soon became clear that this is not your usual band. Josh Dun performed a drum solo while the audience (literally) held him up, as almost everyone was cheering him on in some form or another. His performance was amazing to watch and I had a keen appreciation for the effort and skill he possessed in the difficulty of the songs he was playing. 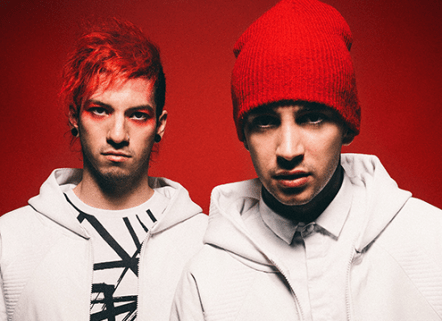 Posted in Music and tagged gig, Music, review, twenty one pilots. Bookmark the permalink.